Deanne Stillman Rex Weiner, circa 1971. 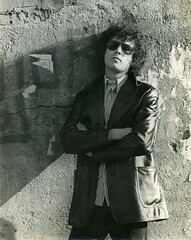 Rex Weiner co-founded The East Village Other’s successor, the pioneering New York Ace (1972–73) and according to his FBI file, was a founding staff member of High Times. He recalls getting his start at EVO. The newly minted moniker echoed amongst my new colleagues in the vast, shadowy loft. At EVO you had the name you were born with and the name that EVO gave you: Jackie Diamond was Coca Crystal, Alan Shenker was Yossarian, Jackie Friedrich was Roxy Bijou, Jaakov was “The Arab,” Charlie Frick was Zod, and so on. And so with my next byline I was reborn in 1970, a new decade with a new name, and on my way as a writer, of sorts.